Delicious petits fours filled with delightful flavors. A perfect addition to your wedding party. 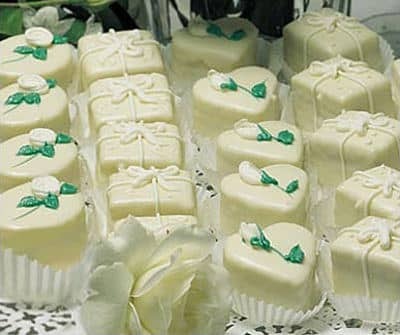 With a hint of nostalgia and a dash of romance, this collection of graceful wedding petits fours is the perfect complement for an elaborate wedding, reception, or special tea. Created in inspired tones of ivory and cream with flourishes of white and spring mint. Varieties include: Ivory Hearts, Lemon Packages, Pineapple Packages, dainty Apricot Roses, Raspberry Lily of the Valley, and delicate Bittersweet Chocolate and Orange Impatiens.